Richmond, a city, port of entry, and the capital of Virginia and of Henrico co., the largest city in the state, on the N. bank of James river, here crossed by five bridges, at the head of tide water, and at the lower falls, about 150 m. from its mouth, and 95 m. S. S. W. of Washington; lat. 37° 32' 17" N., lon. 77° 27' 28" W.; pop. in 1790, 3,761; in 1800, 5,737; in 1810, 9,785; in 1820, 12,067; in 1830, 16,060; in 1840, 20,153; in 1850, 27,-570; in 1860, 37,910; in 1870, 51,038, of whom 3,778 were foreigners and 23,-110 colored; in 1874, 60,705. The city is built on Richmond and Shockoe hills, which are separated by Shockoe creek, and is surrounded by beautiful scenery. It is regularly laid out and well built; the streets, which are lighted with gas, cross each other at right angles. There is a line of horse cars. On Shockoe hill are the state capitol and other public buildings. 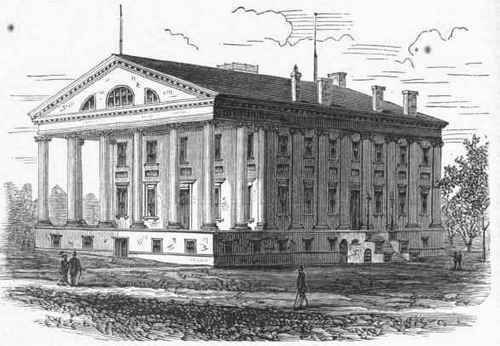 The capitol, in the centre of a park of eight acres, is a large and imposing edifice, having at one end a handsome portico; it contains in its central hall Hou-don's celebrated statue of Washington, and near by a marble bust of Lafayette. On the east of the capitol square is the governor's mansion. On the esplanade leading from the mansion toward the W. gate of the square stands a monument by Crawford, consisting of a bronze equestrian statue of Washington rising from a pedestal of granite surrounded by bronze figures of Patrick Henry, Thomas Jefferson, John Marshall, George Mason, Thomas Nelson, and Andrew Lewis. The square also contains a marble statue of Henry Clay. Among the principal public buildings, in different parts of the city, are the state penitentiary, state armory, court house, jail, custom house (also occupied by the post office), theatre, and two markets. There are several cemeteries, the handsomest of which is Hollywood. The falls of James river afford immense water power. Vessels drawing 16 ft. can ascend to within a mile of the centre of the city, at a place called Rockets, and those of 18 ft. draught to Warwick, 3 m. below. A canal has been built around the falls, and above them there is navigation for over 200 m. Improvements are in progress in the river, which are expected to render the docks accessible by vessels drawing 19 ft. The James River and Kanawha canal extends to Buchanan, 196 1/2 m.
Richmond is the point of intersection of five lines of railroad, viz. : Chesapeake and Ohio; Richmond, Danville, and Piedmont; Richmond, Fredericksburg, and Potomac; Richmond and Petersburg; and Richmond, York River, and Chesapeake. The value of its foreign commerce for the year ending June 30, 1874, was as follows: imports, $156,260; exports, $3,-463,626. The number of entrances was 33, tonnage 9,032; clearances 74, tonnage 36,305; number of vessels belonging in the district, 31, tonnage 2,528. The chief articles of export are tobacco and flour. The latter is noted for its excellent quality, and is mostly shipped to Brazil. Great quantities of tobacco are shipped to the north. The number of entrances in the coastwise trade for the year ending Sept. 30, 1873, was 719, tonnage 512,613; clearances, 579, tonnage 487,004. Regular lines of steamers run to Norfolk, Baltimore, Philadelphia, and New York. The manufactures give employment to more than 4,000 men. The principal establishments are 13 iron works, machine shops, and founderies, producing all kinds of wrought- and cast-iron work, steam engines, agricultural implements, tobacco machinery, etc. ; one sugar refinery, one tannery, four manufactories of plug and smoking tobacco, four of cigars, three of coaches and wagons, one each of saws, files, etc, of sash, doors, and blinds, of sheetings and shirtings, of stoneware, sumach, cedar ware, bedding and corn husks, furniture, and paper boxes; a type foundery, a stone-cutting establishment, and five flouring mills, capable of producing 2,000,-000 barrels annually. The Tredegar company has a capital of $1,000,000 and employs 1,200 hands, producing spikes, axles, bar iron, freight cars, etc., to the annual value of $3,250,000. There are several granite quarries in the vicinity. The city contains four national banks, with an aggregate capital of $1,400,000, six state banks and savings institutions, with $1,000,-000 capital, and ten insurance companies. It is divided into six wards, and is governed by a mayor and council. The police force on Feb. 1, 1875, consisted of 82 men. The fire department comprises five steam engine companies, two hook and ladder companies, and one hose company, with a total of 100 men, and has a telegraphic alarm. The city is supplied with water from two reservoirs, with an aggregate capacity of 50,000,000, gallons, which are filled from the river by force pumps. The assessed value of real estate in 1874 was $41,600,000. The receipts during the year ending Feb. 1, 1875, amounted to $1,574,355 37, including $68,670 84 on hand at the beginning of the period; disbursements, $1,495,717 56; balance, $78,637 81. The bonded debt on Feb. 1, 1875, amounted to $4,239,727 97; floating debt, $82,379 18; total, $4,322,107 15. The whole number of persons admitted to the city almshouse during the year ending on that date was 812; average number of inmates, 245. One of the state insane asylums is situated here. There are several orphan asylums and other charitable institutions. The public schools are under the charge of a board of nine members, besides the mayor, who is president ex officio. There are seven school houses for white children, with an aggregate seating capacity of 3,093, and five for colored children, with a seating capacity of 1,758. The number of schools in operation during the year ending June 30, 1874, was 92, of which 59 (1 high, 21 grammar, and 37 primary) were white, and 33 (5 grammar and 28 primary) were colored; whole number of teachers, 105, of whom 10 were colored; pupils enrolled, 4,959 (3,041 white and 1,918 colored); average daily attendance, 3,595 (2,228 white and 1,367 colored). The expenditure for school purposes during the year ending Aug. 1, 1874, amounted to $80,932 52, of which $50,542 90 were for teachers' wages and $19,108 26 for construction and furniture; value of school property on the above date, $207,537 75. There are numerous private schools. Richmond college, under the control of the Baptists, founded in 1840, has a library of 6,000 volumes and a law department organized in 1868. The Richmond institute (Baptist), for theological instruction, was founded in 1868; it has a library of 1,200 volumes. The medical college of Virginia was established in 1851. Seven daily (two German), four semi-weekly, and ten weekly newspapers, and two semi-monthly and seven monthly periodicals are published. There are 49 churches, viz. : 15 Baptist (7 colored), 1 Disciples', 6 Episcopal, 1 Friends', 4 Jewish, 3 Lutheran, 11 Methodist (1 colored), 4 Presbyterian, 3 Roman Catholic, and 1 Unitarian. - Richmond was founded by William Byrd in 1737. It was incorporated in 1742, and became the state capital in 1779, at which period it was a small village. On the night of Dec. 26, 1811, the theatre took fire while crowded with spectators, of whom upward of 70 perished, among them the governor of the state. A church, known as the "Monumental" church, has been erected on the site. In May, 1861, Richmond was made the seat of government of the "Confederate States of America," and it so continued until their overthrow in April, 1865. Although geographically near the N. E. frontier, it was practically the military centre of the confederacy. If the railroads meeting here, and extending to every part of the south and southwest, had been planned for military purposes, they could not have been better placed. The defensive position of the city is excellent. On two sides it is covered by the James; on the other sides the Chickahominy and swamps form a natural line of exterior defence. Here also were mills, manufactories, and founderies. When McClellan landed on the peninsula in the spring of 1862, the immediate capture of Richmond was apprehended; and even while he was held in check at York-town a panic arose. On April 21 the confederate congress hastily adjourned; the government archives were packed up, and the railroads were crowded with fugitives. The panic increased when Yorktown was abandoned, Norfolk seized, and the Merrimack destroyed. But the state legislature resolved that the city should be defended to the last extremity; the governor ordered that all business except the filling of government contracts should be suspended at 2 o'clock; the militia was to assemble at 3 and drill till sunset. At this time there were no fortifications, and no attempt was made to obstruct the passage of the Chickahominy; and a determined attack at any time during the campaign would have had good chances of success. From August, 1862, to June, 1864, while the war was carried on in northern Virginia, Maryland, and Pennsylvania, Richmond was held only by a few thousand militia; and several expeditions, mostly of cavalry, were undertaken rather with the design of liberating the Union prisoners and destroying the public works than of permanently holding the city, which might have been easily retaken by the confederates, who were in force between it and the Union army of the Potomac. In March, 1864, Kilpatrick, with 4,000 cavalry, came on the north within 4 m. of the city, penetrating two lines of defences, but was stopped at the third, and abandoned the enterprise. At the same time Dahl-gren with a few hundreds reached the inner line from the south, but was repulsed, himself killed in the retreat, and his command dispersed. Meantime the defences of Richmond had been made too strong to be assailed in front, and the operations of Grant, although really directed against that city, took the form of the siege of Petersburg. (See Petersburg, Siege of.) Although several strong demonstrations were made against Richmond during the siege, the exterior lines were never carried, the interior lines were never even seen, and in the city itself there was nothing to show that it was beleaguered. The only garrison was the militia of the city, under Ewell, and little was known of what was passing in the army. When, on the morning of Sunday, April 2, Gen. Lee informed Jefferson Davis that the army would abandon Petersburg and Richmond that night, there was a universal panic. The government archives were hastily packed up and taken to the station of the Danville railroad, by which the president and cabinet set off in a special train, and every possible effort was made by the people to escape. As night fell the disorder rose to tumult, riot, and general pillage. Toward midnight the last of the troops had crossed the James, and Ewell, who commanded the rear guard, ordered the bridges to be burned, the ironclads in the river blown up, and everything destroyed which could be of use to the enemy. In the very heart of the city were four great government warehouses filled with tobacco, which, in spite of the remonstrances of the mayor, Ewell ordered to be set on fire. Close by were the Gallego flour mills, said to be the largest in the world, and the arsenals filled with loaded shells. The flames spread from street to street, covering acres of the business part of the city, and the tumult and pillage continued all night. Early the next morning the federal general Weitzel entered the city with 20 horsemen, finding before the abatis in his front a line of torpedoes, still marked by flags, followed by three lines of works, each of the inner ones commanding that exterior to it. The whole Union army soon marched in. Gen. Shepley, who had filled the same post at New Orleans, was made military governor. The conflagration was still spreading, and every effort to suppress it was unavailing till toward evening, when the wind veered, and the flames died out. Fully one third of Richmond had been burned, comprising nearly all its business portion.